The new PDF-Out feature allows users to set up digital files using iQueue’s advanced features (such as Imposition, spot color matching, variable data, etc…) and save them as high-res PDFs for output to any digital printer (including non-Xanté devices) on your network. Everyone in your shop can use iQueue’s prepress tools and share digital files from one workstation to the next. 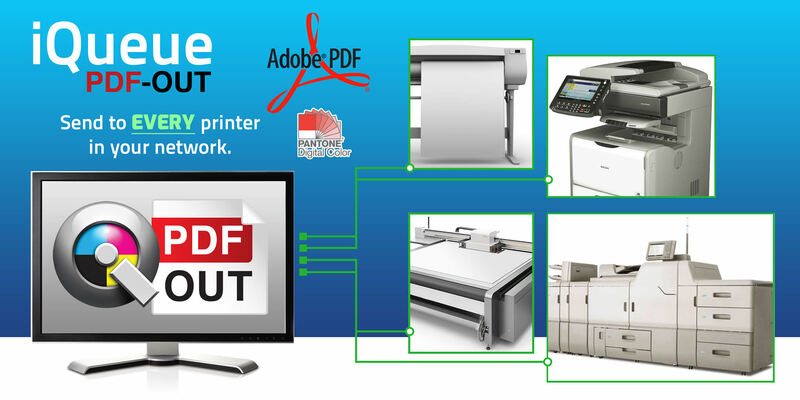 Let iQueue Workflow drive every digital print device in your shop. Until now, iQueue’s powerful prepress tools and workflow automation could only be used in conjunction with Xanté digital printers / presses. But, iQueue’s new PDF-Out feature allows users to setup customer files for output to additional (non-Xante) digital printing devices. iQueue makes it easy to handle complex digital files, make independent CMYK density adjustments, match critical spot colors, apply imposition / tiling, generate QR Codes, share files between workstations and more.